The ‘World’s Best Chocolate Cake’ can now be found in the backstreets of Tokyo’s Omotesando area. Bubó is a Barcelona-based patisserie known for its beautifully designed cakes and artisanal chocolates. On my recent trip to Japan, I visited Bubó’s Tokyo outpost to try Xabina, the chocolate creation that received the ‘World’s Best Chocolate Cake’ mention at the 2005 World Pastry Cup in Lyon. Worth the trek? Absolutely. The Xabina cake is velvety, rich, and a chocolate masterpiece. I enjoyed the chocolate macaron on top and the chocolate mousse inside is a cloud. I’ll reserve judgment on whether it’s the world’s best chocolate cake because there are simply too many chocolate creations I haven’t tried yet. But to date, it is certainly the best and most gorgeous chocolate cake I’ve had. Pick up some chocolate truffles on your way out–ask for samples of the Macadamia nut ones, they’re incredible! When you visit Bubó in Tokyo, try not to be too distracted by the amazing chocolate gallery on the first floor and head straight up to the Cafe. Once you’re seated, your server will bring you a beautifully detailed cake menu for you to peruse. Other than the award-winning Xabina we also ordered a Nameraka, which is a sponge cake with tonka bean cream on top. The slightly smoky tonka cream was delicious and paired well with the lightly fried mint leaves. 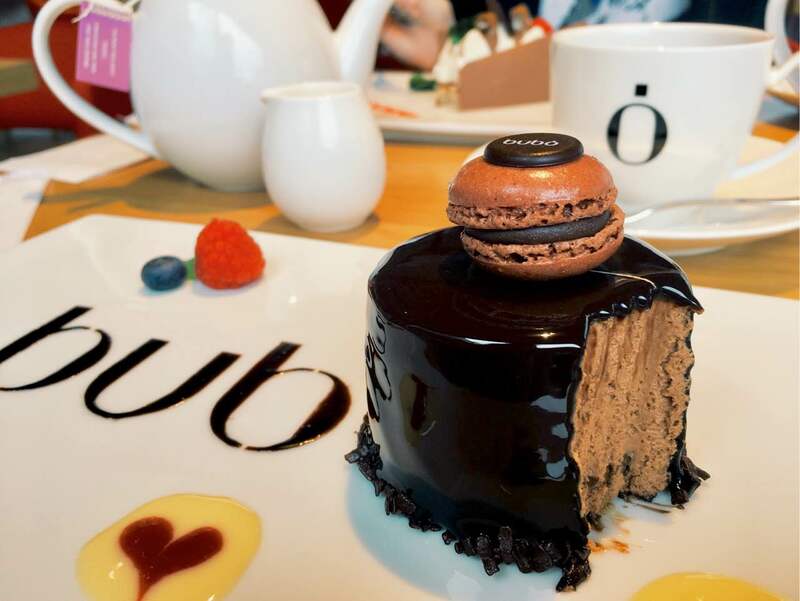 My favorite part of Bubó was definitely the creative use of ingredients to compliment the patisserie’s signature chocolate flavors. Bubó is a quick walk from the Omotesando Station, right across from the popular Dominique Ansel Bakery. Don’t pass up either–sit down at Bubó for a Xabina cake, marvel at the velvety chocolate goodness, and then pick up a seasonal Cronut across the street after. Noted. Will visit. Thanks for the recommendation! One more reason to visit Tokyo! Yes indeed! Always new cafes and restaurants to try in Tokyo. beautiful sweets! I didn’t know this shop even I live in Tokyo. Thanks for information. You definitely have to, it’s all chocolate goodness!